The median cleft face syndrome (MCFS) was defined by De Myer1 in 1 967 as the occurrence of ocular hypertelorism in association with other defects such as primary telecanthus, median cleft of the upper lip and premaxilla, median cleft palate, median cleft nose, cranium bifidim ocultum, and low V-shaped frontal hair line (widow's peak). This paper describes the first case of MCFS associated with unilateral kidney agenesia. The authors present a new hypothesis that suggests the eyelid is the structure responsible for the circular area of hair growth suppression around the eyes. An 11-month-old girl, born in Minas Gerais, Brazil, was first examined at 1 8 days because of an infected corneal ulcer of the left eye (Fig. 1). She is the only child of nonconsanguineous healthy parents. The mother reported that the child was born without the left upper lid. There is no history of drug ingestion or x-ray exposure during the pregnancy. Physical examination confirmed the absence of the left upper lid and disclosed other abnormalities of the median face. A complete coloboma of the left upper lid was confirmed. There was a continuous transition between the skin of the frontal region and the bulbar conjunctiva. The exposed cornea was injected and ulcerated (Fig. 1). No posterior structures could be visualized. 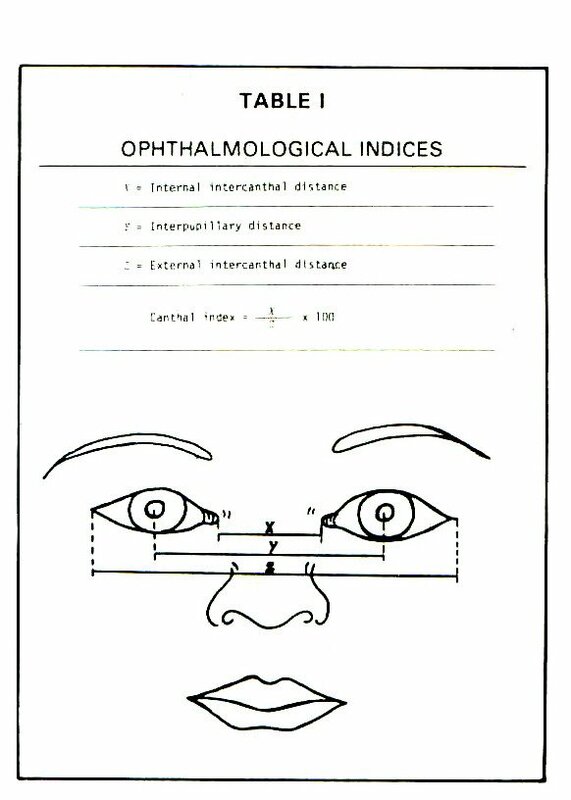 Internal intercanthal distance was 32 mm; external intercanthal distance was 83 mm; interpupillary distance- 46 mm; and interorbital distance - 21 mm (Table I). Electrococleography revealed a severe neurosensory hearing deficit on the right side and a mild deficit on the left side. Physical examination showed the presence of a high arched palate, a bifid nose with absence of the tip, and a broad nasal base. The nasal cleft followed an assymetric line, with its concavity open to the left (Fig. 2). Cranial perimeter was 430 mm; biauricular distance was 256 mm; anteroposterior distance - 260 mm; and bregma- 30 ? 30 mm, fibrous. Clinical and radiologic examination did not disclose either midline frontal disjunction or frontal depressions suggestive of cranium bifidum ocultum; a high brow was present. Results of pneumoencephalogram, EEG, and Gesell tests were within normal limits. Urography and urethrocystography revealed exclusion of the right kidney with the urether ending in a blind pouch (Figs. 3 and 4). In this patient, as revealed by contrasted radiological studies, the right kidney seems to be absent. Although this malformation, apparently, is not directly associated with MCFS, it is interesting to note the simultaneous embryological organogenesis of the eyes and kidneys and the possible deleterious influence of some agent upon their development. De Myer1 subdivides MCFS into four facial types: (1) all defects in the extreme degree; (2) hypertelorism, cranium bifidum ocultum, and median cleft nose- subdivided into three degrees of severity according to severity of the nose cleft; (3) hypertelorism, median cleft nose, and medial cleft prolabium, which may involve the premaxilla, but not the palate; and (4) mild degree of median cleft nose and hypertelorism. The subdivision proposed by Sedano' based upon embryologie considerations also presents four types: (a) hypertelorism, broad nasal root, medial nasal groove, and absence of the nasal tip or true clefting of the midline; (b) hypertelorism, broad nasal root, deep median facial groove or true cleft affecting the nose or nose and upper lip, and sometimes the palate; (c) hypertelorism, broad nasal root, unilateral or bilateral notching of ala nasi; and (d) a combination of facies (b) and (c). Anterior cranium bifidum occultum may be found in all four types. Fig. 1. 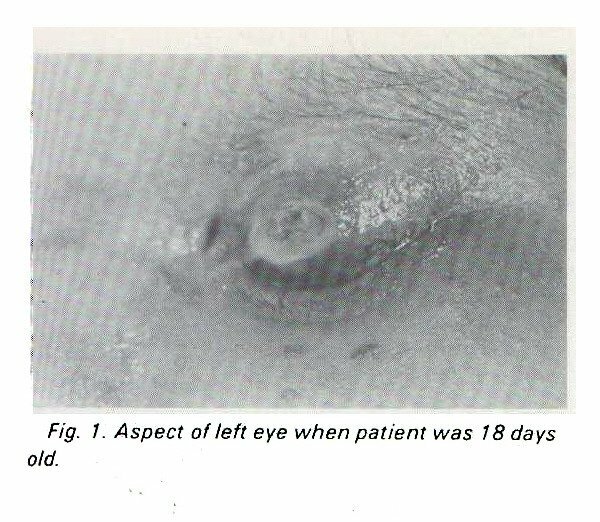 Aspect of left eye when patient was 18 days old. A low hair-line implantation on the left frontal side, roughly resembled a V-line (Fig. 2). Cardiologie, pulmonary, gastroenterologie, and orthopedic findings were normal. Dermatoglyphic analysis and karyotype, including G-binding technique, did not disclose any abnormality. 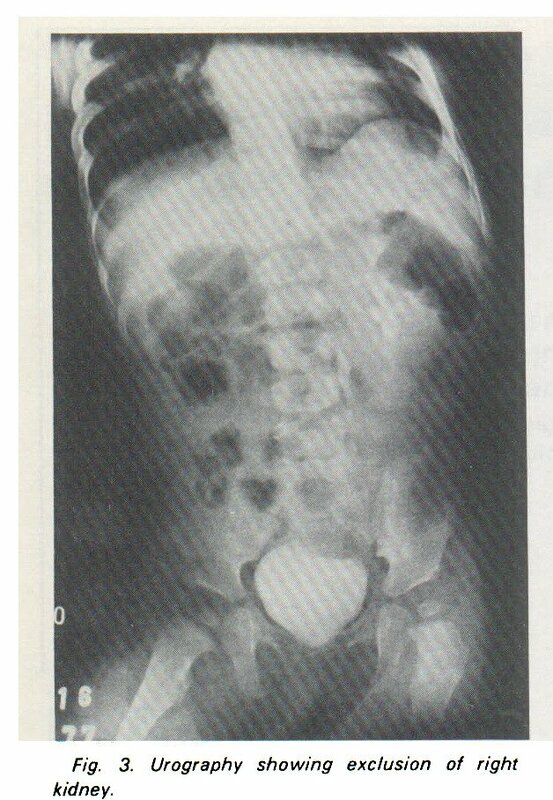 The morphogenesis of the malformations found in this syndrome is still unknown. According to De Myer' the malformations "apparently result from interference with the progressive merging or apposition of structures along the median facial plane. This progressive apposition depends upon local mesenchymal growth vectors in the medial nasal and maxillary processes and upon more general growth vectors which converge the optic axes." Sedano et al: proposed that a failure in the development of the nasal capsule causes "(a) ocular hypertelorism, because the eyes fail to move toward the midline; (b) marked uni- or bilateral frontal prominence, representing protrusion of the brain vesicle in the area (cranium bifidum ocultum); (c) lack of formation of nasal tip and dorsum." Fig. 2. 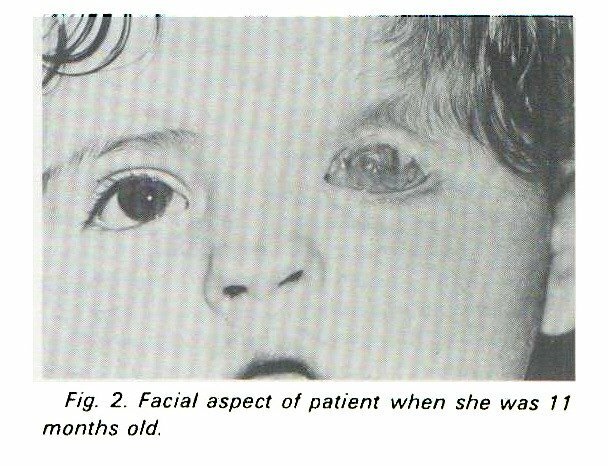 Facial aspect of patient when she was 11 months old. Fig. 3. 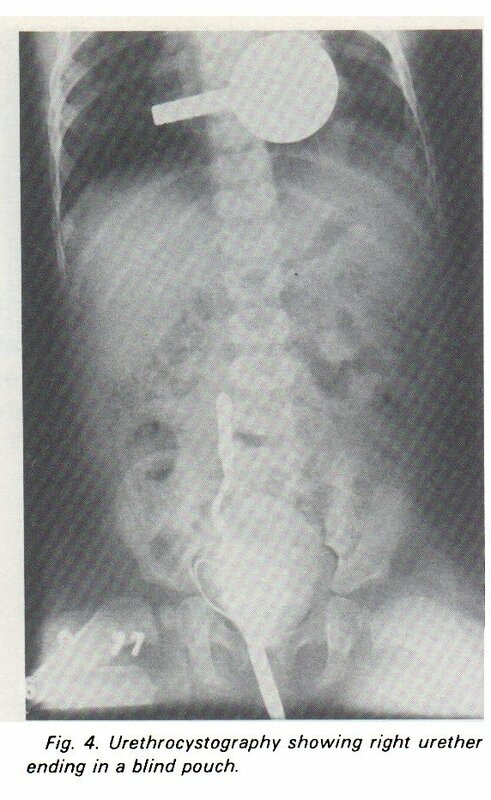 Urography showing exclusion of right kidney. Fig. 4. Urethrocystography showing right urether ending in a blind pouch. The frontal hair line implantation of the propositus roughly resembles a "V" and is deviated towards the left frontal region. Smith and Cohen13 suggest the following hypothesis to explain the presence of the "widow pick" in 44% of the patients with MCFS: Around the eyes there would exist a circular area of suppression of hair growth; and the greater spacing between the eyes, found in hypertelorism, would precipitate a lower implantation of the hair line in the midportion of the frontal region, resulting in a V-shaped hair line (Fig. 6a and b). These authors reported a case with a rudimentary ectopic eye in the temporal region with a hairless area around it, as proof of the importance of the eye in generating a circular area of hair growth suppression. The propositus has complete absence of the superior left eyelid and the hairline corresponding to this area comes near to the left eye (Fig. 6c). A literature review disclosed some cases of partial or total coloboma of the superior eyelid and a low hair implantation in the frontal area corresponding to the coloboma. I4~" In cases of cryptophthalmos, with absence of the upper lid, as there is no hypertelorism, the tongue of hair spreads from the temporal side instead of coming from the medial frontal region.1*1"26 Thus we could suggest that the eyelid might be the structure of the eye responsible for the circular area of suppression of hair growth around the eyes, as long as the lack of eyelid apparently enhances the growth of hair in an area usually devoid of hair. Fig. 5. Facial aspect of patient's mother. Fig. 6. (a) Facial aspect of normal person. Dashed lines in the frontal region delimit the areas under the suppressive influence of the superior eyelids, (b) Ocular hypertelorism. Greater space between the eyes creates conditions for a tongue-shaped area in the m id fron tal region, not tobe under the suppressive influence of the eyelids, (c) Patient presented. The presence of the superior eyelid of the right eye ensures a suppressive activity around the right eye. The absence of the superior eyelid in the left eye would allow hair to grow in an area normally devoid of it. The propositus can be considered as presenting facies (No. 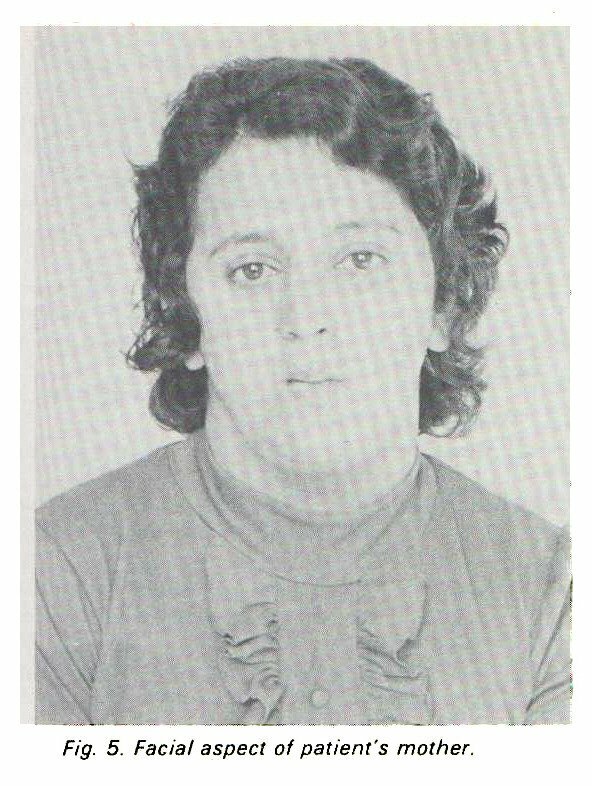 4) according to De Myer1 or facies (a) according to Sedano,2 with the following malformations: ocular hypertelorism and primary telecanthus, median cleft nose with absence of nasal tip, broad nasal root, abnormal frontal hair implantation, high arched palate, neurosensorial deafness, complete coloboma of the upper left lid, and agenesia of the right kidney. The authors present a case of an 11 -monthold girl with the medial cleft face syndrome and the following malformations: ocular hyperterolism, primary telecanthus, cleft nose with absent tip, broad nasal root, complete absence of the left upper lid, and abnormal hair-line implantation in the corresponding frontal region, high arched palate, neurosensorial deafness and agenesia of the right kidney. The authors propose that the eyelid is responsible for the area of hair growth suppression around the eyes. This is the first case report of median cleft face syndrome associated with renal agenesia. This study was supported in part by a grant from C.N.P.q (SIP O4/011), Brazil, and by a grant from Allergan International. Verona Pettyjohn provided editorial assistance. 1. De Myer W: The median cleft face syndrome. Neurol 17:961, 1967. 2. Sedano HO. Cohen MM Jr, Jirasek J, et al: Frontonasal dysplasia. J Pediatr 76:906, 1970. 4. Calli LJ Jr: Ocular hypertelorism and nasal agenesis (midface syndrome) with limb anomalies. Birth Defects 7(7):268, 1971. 5. Freund MM: Hypertelorisme et autres malformations congenitales dans une famille. J Genet Hum 21(4):237, 1973. 6. Warkany J, Bofinger MK, Benton C: Median facial cleft syndrome in bald sisters. Dilemmas in genetic counseling. Teratology 8:273, 1973. 7. Hansman CF: Growth of interorbital distance and skull thickness as observed in roentgenograph^ measurements. Radiology 86:87, 1966. 8. Günther H: Konstitutionelle Anomalien des Augenabstandes und der Interorbita Ibreite. Virchows Arch [Pathol Anat] 290:373, 1933. 9. Günther H: Die Variabilität der Interorbitalbreite und des Augenabstandes. ? Morphol Anthropol 32:250, 1933. 10. Peterson MQ, Cohen MM, Sedano HO, et al: Comments on frontonas'al dysplasia, ocular hypertelorism and dystopia canthorum. Birth Defects 7(7):120-124, 1971. 11. Mustarde J: Epicanthus and telecanthus. Br J Plast Surg 10:346, 1963. 12. Mustarde J: Epicanthus and telecanthus. Int Ophthalmol Clin 4:359, 1964. 13. Smith DW, Cohen MM: Widow's peakscalp-hair anomaly and its relation to ocular hypertelorism. Lancet 2:1127, 1973. 14. Rapisarda D: Raro caso de coloboma palpebral congenito associado a numerosas anomalías. Resen clin-cient 20:229. 1951. 15. Duke-Elder S: Coloboma of the lid. In System of Ophthalmology, vol 3(2). London, Kimpton, 1965, pp 836-840. 16. Bergsma D, Mckusick VA: National Foundation - Birth Defects. Baltimore, Williams & Wilkins, 1973, ? 27. 17. Nuel: Arch Ophtal (Paris) 1:437-449, 1881. 18. Avizomis P: Ueber kryptophthalmos und microphthalmos. ? Augenheilkd 64:240-258, 1928. 19. Azevedo ES, Biondi J, Ramalho M: Cryptophthalmos in two families from Bahia, Brazil. J Med Genet 10:389, 1973. 20. Chiari ? : Congenitale Amkylo und Symblepharon und congenitale atresia laryngis bei unein kinde mit mehrfachen anderweitigen Bildun gsanemalien. Prager ? Heilk 4:143-1 54, 1883. 21. Dinno ND. Edwards WE, Weiskopf B: The cryptophthalmos-syndactyly syndrome Clin Pediatr 13:219, 1974. 22. Francois J: Syndrome malformatif avec cryptophtalmie. Acta Genet Med Gemellol 18:18-50, 1969. 23. Gupta SP, Saxena RC: Cryptophthalmos. Br J Ophthalmol 46:629, 1962. 24. Ide CH, Wollschlaeger PB: Multiple congenital abnormalities associated with cryptophthalmia. Arch Ophthalmol 81:638, 1969. 25. Key SN: Report of a case of cryptophthalmia. Am J Ophthalmol 3:684-685, 1920. 26. Sugar HS: The cryphthalmos-syndactyly syndrome. Am J Ophthalmol 66:897, 1968. 27. Van der Meulen JC, Ramselaar J, Bloen J: Hypertelorism. Mod Probi Ophthalmol 14:611, 1975.